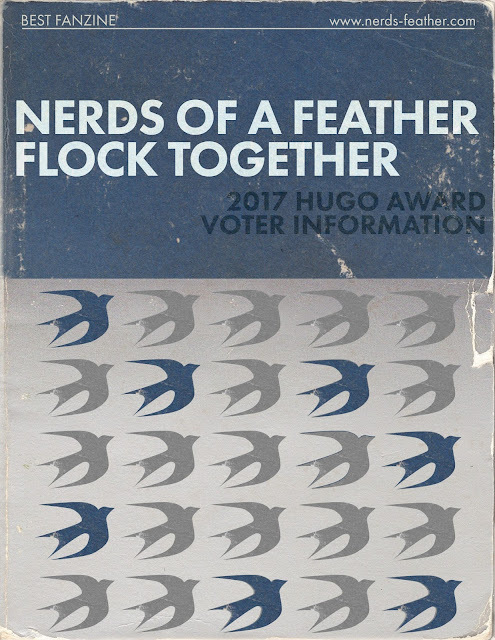 The Voter's Packet for the Hugo Awards has been released and made available to all members of WorldCon 75 and Nerds of a Feather has put together a compilation of what we feel represents the best and the breadth of our collective work published in 2016. While the purpose of the Voter's Packet is to help eligible voters make an informed decision when casting their ballots, we wanted to also make this available to all of our readers who may want to take a look back at what we did last year. As such, below is The G's introduction to the Voter's Packet followed by the Table of Contents with links to each of the essays, reviews, and features we included in the packet. If you'd like, you can also download the files we included in the Voter's Packet and take Nerds of a Feather on the go. The site’s guiding principles were to avoid “grade inflation” to the best of our ability, and to cover as many pockets of fandom as possible. This first principle is reflected almost daily in our review scoring system, which is designed to distribute normally around a theoretical mean score of 5, so that a 7 is pretty darn good and 10s are reserved for works of transcendent quality. In five years, we’ve given out less than a dozen 10s. To put it another way, in a world where every new Christopher Nolan movie immediately lands in the IMDB Top 250, we wanted to be a place where fans could expect a little less hyperbole, especially when discussing new works. The second principle, to cover as much of fandom as possible, found expression in our growing team of contributors. Vance and I each had areas we specialized in (SF/F novels and cult cinema, respectively), but we recognized there was no way we two alone could do justice to the tremendous work and innovation taking place in short fiction, comics, video and tabletop games, television, and so forth. So it is a tremendous point of pride that as our readership has expanded, so have our voices. The many recurring series featured on our site have become one of our signatures, I think. Thursday Morning Superhero, which runs weekly, takes a look at the new comics that arrive in shops every Wednesday. Beyond that, we have: the We Rank ‘Em and 6 Books listicle series; New Books Spotlight, which highlights upcoming books we’re excited about; The Monthly Round, which pairs the month’s best new short fiction with adult beverages; Essentials, which aims to serve as an introduction for those readers who may be new to a particular area of fandom; annual Summer Reading and Holiday Gift Guide series; and two forms of roundtable discussion (Blogtable and Perspectives). We also run special post series, such as 2015’s Cyberpunk Revisited, and the currently ongoing series Dystopian Visions. One of my personal favorite moments from the past five years came when Rudy Rucker, Bruce Sterling, Pat Cadigan, and Paul DiFilippo all agreed to participate in an open conversation on cyberpunk and its enduring legacy. Five years on, and we have been nominated for a Hugo — the ultimate sign of having “arrived.” Only, the ecosystem does not feel as vibrant as it once did. Some of the best sites have closed shop – including both A Dribble of Ink and SF Signal. Meanwhile, the landscape has been affected by institutional- level changes, with conversations about blog posts largely migrating to Facebook, Twitter, Reddit, and so forth. None of this is bad, per se — just different. And in a few cases, we’ve been able to provide an online home to talented writers moving on from these, or from other sites. All the same, fandom still needs its fanzines. So while we are excited to be nominated for a Hugo, we are even more excited to keep fighting the good fight alongside our fellow nominees and all the other great fan blogs out there. In the end, we are just a group of opinionated people writing about what unites us in giddy nerd joy or reduces us to puddles of apocalyptic nerd rage. Most importantly, we do it out of love. What follows is a small sampling of what we’ve done over the past year. I hope you’ll enjoy reading it as much as I’ve enjoyed contributing to its production. 1. Stranger Things: A New Dramatic Animal?